I tried your link yesterday but I keep on getting stuck at the app naver registration.But thanks to this.I can finally play the game. Thank you so much for sharing it! Cheers! Right, figure almost everything out, will update this post as i continue to play. I played a lot more of it. It's definitely fun as a mobile game, and has a bit of a mega man feel in terms of its steadily increasing difficulty and importance in placing shots. The cards gain percentage as you clear stages and once at level 100 you can merge them with another card to level that card up, which increases the stats they give you. They have cards with activate-able effects, like the magnet enemy card that pulls all r coins (basic currency needed to level cards and use bonuses before levels) on the screen to you. They also have cards with passive abilities, but I can't read korean so I don't Joe what they do. There's 4 main challenges per level, which is to collect a certain number (usually all) of r coins in a stage, kill a certain number of enemies, and to beat the stage. Theres also a bunch of other daily and overall challenges, from collecting a total number of things across all stages, to a bunch of other things I can't read. Only thing I don't like is that you gave a certain number of e tanks, abs those tanks are used to play stages. Even if you quit a stage you use up that tank, but if you get below 5 of them they start to give you one for every 5 or 10 minutes. All in all, it's a pretty fun game. Definitely worth checking out. Actually I got one thing wrong and want to make an amendment to another. One if the challenges to clear is to beat the stage in a certain time frame, not just to clear the stage. Also, after playing a stage the is a bit of a time limit before you can play it again. You are a good man, ProtoDude. Any chance rockman gold empire could be reuploaded? Stuck at the title screen. I'm not sure if it wants a password or a user name, but nothing is taking. It wants you to enter a name for yourself, for the leader boards I guess. Yeah, it's so unobivously obvious that I forgot to do that for a few minutes. New APK version as of Jan/13, does anyone know if it's safe to update by reinstalling and not lose the user data? Also, how to properly save it in case of switching devices? Can you please put a download link to the latest / updated version of the game please ? Can you upload the latest version of that apk ? Please ? To those who want to update the game,google for an app called Qoo App and download it. 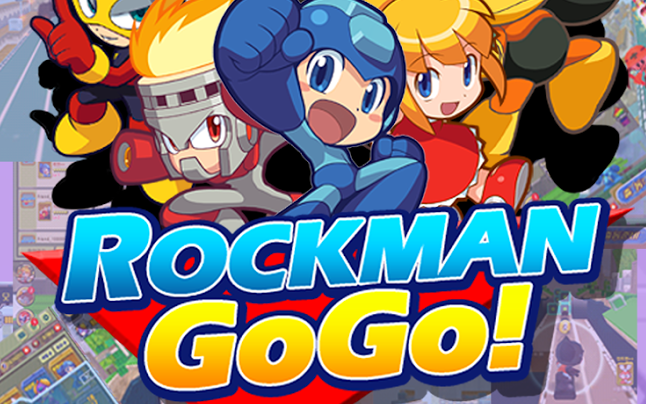 Once installed,look for rockman gogo game and you can install/update it from there. Just be sure to enable install from unknown source first. Game isn't working, and I have qoo app installed. It used to work before, but now can't get past the title screen, which says to be a connection problem (which isn't). What to do? I wonder if reinstalling will fix it, but I don't want to restart from the beginning. The game's service shut down on September 25, 2015, making the game unplayable.